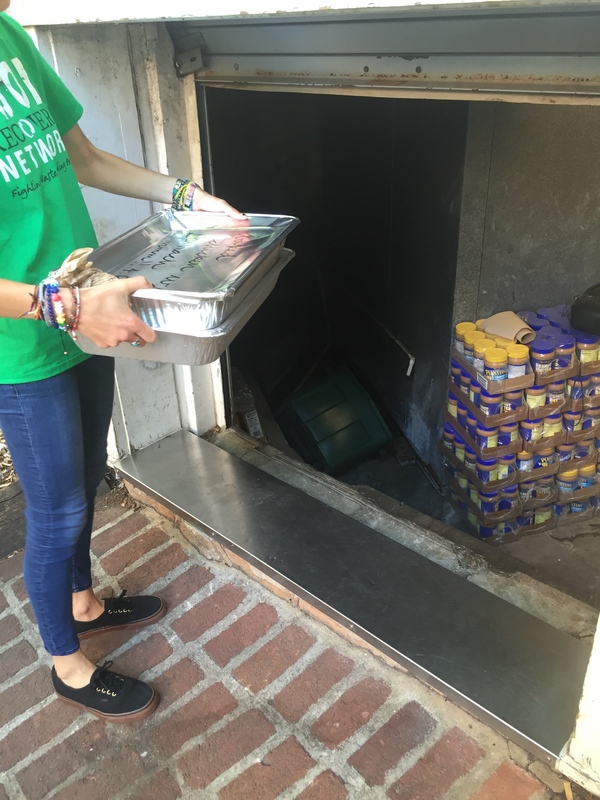 The Food Heroes deliver pans of food to the Open Door Community, a local safe house located near campus. A newly chartered student organization, Panther Food Recovery Network (PFRN), collects wholesome meals from one of Georgia State’s dining halls and delivers them to The Open Door Community, a safe house organization that provides services to the homeless. Recently, the organization collected approximately 113.2 pounds of saved food. 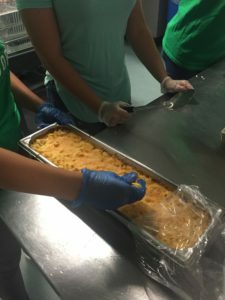 On June 21, early Tuesday morning, Piedmont Dining Hall was filled with Food Heros who prepared with fresh rubber gloves, hair nets, clean aluminum pans and thermometers to start the food collection process. The dining hall staff member rolled out carts of food ranging from fresh veggies, baked chicken, wild rice and more. The success of Panther Food Recovery Network is acquired due to a motivated team that is ready to help the community. Co-president Diana Beach helps the student organization with planning by extending her services in any area where assistance is needed. Beach is looking forward to executing that planning into the Fall 2016 semester. Panther Food Recovery Network serves as a middleman for delivering meals to a local community center. PFRN members are developing a system that will prepare them for next semester when all three of Georgia State’s dining halls open. Being able to help others is a rewarding feeling for the members, especially for Kimberly Rodriguez, the event coordinator for PFRN. Rodriguez is a nutrition major at Georgia State, and believes working with the student organization has helped her network with other students that are willing to give back to the community. “I love seeing the affect on the people that we give the food to and how appreciative they are,” Rodriguez said. Food safety is critical and when it comes to transporting fresh food, the Food Heros must take extra precautions to eliminate foodborne illnesses. Prior to transporting the food, each of the members and volunteers undergo training on how to properly handle the food. One-by-one the pans of food undergo specific testing that determine whether it’s good enough to be delivered and stored. The food cannot be used if it’s more than two or three days old, and it must be stored at a proper temperature to ensure freshness. Panther Food Recovery Network members check the temperature of all the food before they save it for collection. “We wanted to keep our radius [for] donating the food small, to be close enough for Georgia State Students [who] need those resources,” Beach said. The student organization keeps track of all the food that is taken. Using a food thermometer, a member or volunteer of PFRN takes the temperature of the food within the pan. And if it’s over 45 degrees it cannot be taken. Once the temperature is taken and the food passes the remaining requirements, it can be re-packaged, labeled and weighed. “To help with this big need in our country, we can help solve or decrease [hunger], and that’s what we are here to do,” Beach said. The Food Recovery Network is a national organization that was designed to educate and train people on ways to safely decrease food waste. There have been 1,324,680 pounds of recovered food since 2011, according to the organization’s website. For more information email dbeach3@student.gsu.edu or vist the organizations Facebook page.